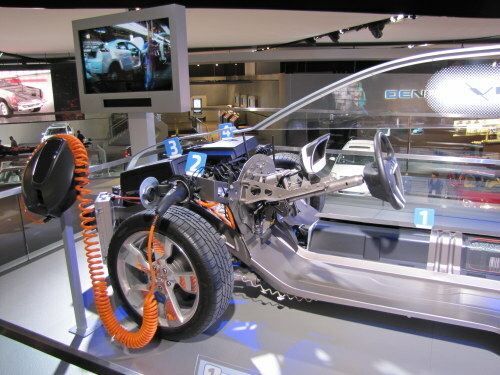 Enter Envia which has developed its High Capacity Manganese Rich (HCMR) cathode, a material for advanced batteries that stores more energy per unit of weight than anything else in use today. According to the GM news release and the Envia press release, the cathode provides twice the energy density of lithium cobalt oxide. This is a direct benefit of federal investments in science and innovation. With this new agreement, a battery technology, originally developed at the Department of Energy’s Argonne National Laboratory and licensed to Envia, is making its way into the market. Also, according to the Envia website, the material is stabile at higher voltages, which empowers it to access high capacities with long cycle life. The combination of high capacity and low cost metals helps to significantly lower the price per kilowatt-hour (kWh) of energy storage. Envia uses a combination of processing techniques to tailor the electrode materials at the nanometer and micron level. Examples of some of these techniques include dopants, coatings and process conditions. The bottom line for automotive applications is this: By putting more energy in each battery, the number of batteries required decreases – by 50% in Envia’s case, dramatically reducing the overall cost of the application. GM is not alone in its investment, though. Envia has also raised equity financing from Asahi Kasei, Asahi Glass, Bay Partners, Redpoint Ventures and Pangaea Ventures. "Offering Envia's HCMR technology for pilot vehicle programs is a major milestone in the commercialization of higher-performance lithium ion cells," said Dr. Sujeet Kumar, founder and chief technology officer of Envia Systems. For the record, HCMR is the first next-generation solution to leverage Argonne National Laboratory's composite cathode material, licensed by Envia. "The relationship between Argonne and Envia dates back to 2008, when we collaborated to make cathode material in small quantities. This collaboration is a demonstration of the extraordinary impact and value of Department of Energy's investment in basic research, and shows the very real contribution the national laboratories make to our country's prosperity," said Dr. Jeff Chamberlain, head of Argonne's Energy Storage Initiative. HCMR is a major step which hastens the pace of the electric vehicle revolution and advances the timetable for mass commercialization of EVs and PHEVs.